I met up with A in Burlingame after cruising around Monterey and the south bay. Burlingame is another cute little ritzy town with a strip of shops and restaurants. We decided on Mingalaba, which is burmese. I’ve only had burmese, years ago, and don’t remember too much from it. I think I remember that it was like thai food. The menu is a strange amalgam of indian, thai, and other asian cuisines. Which makes a helluva lot of sense when you look at a map of burma. It’s a rather large country, with india and the bay of bengal on its left, and thailand and china on its right. We ordered mango lassis, and we all know that’s traditionally indian/pakistani. We didn’t really know what to order, so we picked the House Special Noodle with chicken. 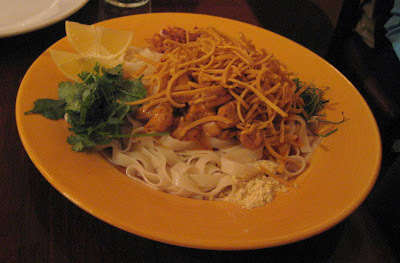 It was a flat rice noodle dish with coconut chicken, lime leaves, cilantro, yellow pea’s powder, onion, and fried thin noodle on the top. It comes unmixed and then the server mixes it in front of you. And here’s the result. We both enjoyed this a lot. I’m usually not into anything with coconut milk in it (like this chicken), but I still liked this. The one thing I absolutely did not care for was the lime leaves. I found them to be absolutely disgusting. They were sliced extremely thin but still gave off an extremely strong taste. Luckily, after realizing their awfulness, I was careful to avoid them. 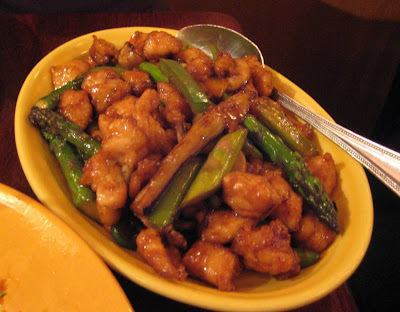 We had to order something else so we just threw the dice and went with the Asparagus Spicy Chicken. This was pan fried chicken breast with asparagus, fresh basil, eggplant, fresh mushroom, and green chilies in a spicy sauce. This had a straight up thai basil flavor, reminiscent of many thai dishes. So if you’re into that, you’ll be into this. This also was not spicy at all, so don’t let the name fool you. It’s just a nice chicken stir fry dish. The asparagus were of the extremely fat variety, and I’m partial to the scrawny spears. Service was fine, if not seemingly cold and robotic. But I think that was just the server’s personality, or lack thereof. One could not describe her as warm and fuzzy, but the service itself was fine. And the meal actually turned out to be quite a bargain! On this tuesday night, the place was packed! 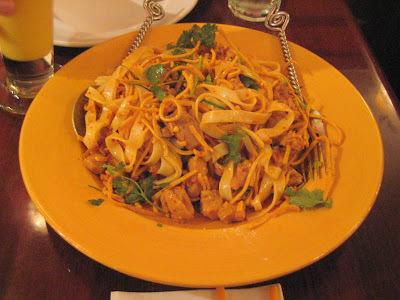 If you’re a fan of thai food, then you should definitely give Mingalaba a try. Heck, I can’t stop saying mingalaba! When in Philly, try Rangoon. It's the only Burmese I've ever had, so I can't compare it to any other Burmese…but it's fantastic. Easily my favorite place in Chinatown – and that says a lot.